Did I mention I believe Koreans have mother issues? I believe Koreans have mother issues! 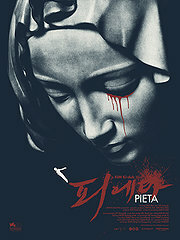 Seeing “Pieta” (praised by Hongkong Film Festival audiences, I think awarded with director’s or script prize) just a bit after seeing “Mother”, a scheme appears. That scheme is that Korean mothers are all-embracing, absolutely without compromise when it comes to taking care of their babies. Those babies being grown-up men or toddlers doesn’t matter, they are all on when it comes to protecting them from harm (“Mother”) or avenging them (“Pieta”). The film is about a professional thug, loan shark and sadist, who indulges in supporting his clients collect the money they owe him by helping them have accidents to collect insurance money. This is a bit hard to watch at times, but then again, if you get into Korean movies, you know what you’re in for. Somebody wrote in a review that the first hour of the movie required her to constantly look away, while the rest made her cry. I understand what she means… Our “hero” is faced with some twist of fate, in the form of a woman who decided now it’s time to make up for all the times she has neglected her son, and devotes herself to the task without compromise whatsoever. While loan-shark man starts off into this newly found family pattern with, let’s say, hesitation, he quickly realises that there have been some things about having a caring mother he actually did miss and appreciates, if not longs, to catch up on. Now… this is not the place to spoil the fun of watching the movie by indicating how this will end, but let’s say that Korean mother-son relationships are always complicated, and that if you ever encounter a Korean mother with a plan, you better run the other way, as you never know what part in her scheme you might end up playing.